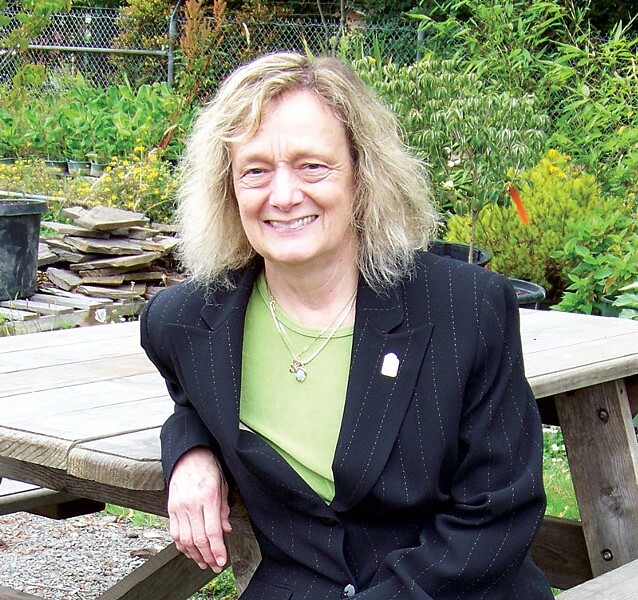 Humboldt State University announced today that President Lisa Rossbacher will retired at the end of this academic year, bringing an end to a short but controversial tenure. A geologist by training, Rossbacher became HSU’s first woman president in July of 2014 and — with just about five years at the helm when she leaves — she will also have had one of the briefest terms. But that time has been marked by a number of controversies, including what many view as a lack of responsiveness in the wake of David Josiah Lawson’s fatal stabbing at an Arcata house party to concerns raised by his family and students of color, who said they do not feel safe on campus or in the surrounding community. Lawson's mother, Charmaine Lawson, called for Rossbacher to step down from the post when she spoke before the CSU Board of Trustees last month about what she sees a lack of support from the university. According to the release, a national search for Rossbacher's replacement is slated to begin soon. Lisa A. Rossbacher, who has served as President of Humboldt State University since 2014, announced today that she will retire from the California State University system after the 2018-19 academic year. In a message to the HSU community, President Rossbacher said that she had enjoyed serving as president, but the timing was right to move to the next stage of her career. She had discussed her plans over the summer with CSU Chancellor Timothy White. President Rossbacher also used her message to highlight some areas of recent success for the University, including: a sustainable budget, improved graduation rates, investment in student support programs, efforts related to diversity and equity, and additional tenure-line faculty positions. CSU Chancellor Timothy White praised President Rossbacher for her commitment and achievements at HSU. The CSU will soon launch a national search for President Rossbacher’s successor. Under university policy, the chairman of the CSU Trustees, Adam Day, and Chancellor Timothy White will select a committee made up of various campus stakeholders who will be publicly announced at a later date. Campus and community input will be sought in an open forum held on campus. During the remainder of 2018-19, President Rossbacher says she will focus on goals she outlined during her Fall Welcome. These include the ongoing initiatives related to student success, strengthening a welcoming and supportive community for HSU’s growing diversity, achieving a balanced budget, and addressing the recommendations from the recent review by the WASC Senior College and University Commission. During her time at HSU, President Rossbacher has focused on promoting student success, developing a sustainable budget, and aligning programs with the core mission of the University. She led development of the 2015-20 strategic plan, which includes four overriding goals: (1) supporting student success, (2) developing a welcoming and safe environment for diverse populations, (3) expanding partnerships with local communities, and (4) being a good steward of resources, including fiscal, physical, and intellectual resources. President Rossbacher has been actively engaged in the Equity Alliance of the North Coast and Equity Arcata, both of which bring together multiple stakeholders to create a community that is welcoming and supportive of diversity and inclusion. She also re-instituted the University’s Native American Advisory Council and this year began serving as the presidential liaison to the CSU’s Native American Initiative. •	Four-year graduation rates at HSU reached an all-time high of 21 percent, while six-year graduation rates increased to 52 percent. •	HSU’s accreditation was reaffirmed for an eight-year period by the WASC Senior College and University Commission. •	A sustainable budget plan was developed and the University is on track to have a balanced budget for the 2019-20 academic year. This is a reversal from four years ago, when the University had been running deficits and was on the verge of exhausting its operating reserve fund. A modest operating reserve fund and capital reserve fund have now been created. Under new CSU guidelines, campuses are expected to build capital reserves so that they can contribute funds to build new facilities. •	Significant investments were made in new tenure-line faculty, and the student-to-faculty ratio has gone from 22:1 to 20:1. •	Important investments were made in student support programs, including the Cultural Centers for Academic Excellence, the RAMP student mentor program, advising, and mental health programs. •	New place-based learning communities were created to support students in the sciences and natural resources. Based on initial success in persistence and other factors, new learning communities have recently launched for other students, including those who are undecided on a major. •	New grants for research and sponsored programs reached over $23 million annually. HSU researchers are currently leading hundreds of grant-funded projects with a total value of more than $86 million. •	HSU earned a gold rating for its sustainability efforts from the Association for the Advancement of Sustainability in Higher Education, highlighting the University’s role as a higher education leader in sustainability. •	Faculty and students from HSU provided statewide leadership in conducting research, making policy recommendations, and implementing local programs to address student food and housing insecurity. President Rossbacher is the seventh president of Humboldt State University. She came to HSU after serving as president of Southern Polytechnic State University in Georgia, and had previously served as a faculty member and administrator at California State Polytechnic University, Pomona, Whittier College, and Dickinson College. She was the first woman geologist to become a university president in North America. President Rossbacher graduated from Dickinson College with a degree in Geology, received master’s degrees from the State University of New York at Binghamton (now Binghamton University) and Princeton University, and earned her Ph.D. in Geological and Geophysical Sciences at Princeton University. She has authored books on geology, science, and the media. Her research interests focus on the role of water and water ice on the planet Mars, and in 1984, she was a finalist in NASA’s astronaut selection process. I am writing to share with you my plan to retire from the California State University at the end of the current academic year, effective June 30, 2019. This was not an easy decision, as I very much enjoy being part of this campus community. I am inspired each day by our amazing students and by the commitment of our faculty and staff. Working together, we have made strategic choices to prioritize the academic experience of our students and to position the University for future success. This is why I believe now is the right time for me to move on to the next phase of my career. I want to take this opportunity to reflect on how our work together has put HSU on a stronger footing going forward. When I arrived at HSU at the beginning of the 2014-15 academic year, the University’s base budget deficit was projected to exceed $4 million, a number of important programs were operating on one-time funds, and the University was on track to exhaust all operating fund balances by the following year. To address this challenge, we reduced expenditures even while continuing to invest in the core mission of the institution. We increased the University’s operating fund reserves, and we will address the remaining deficit during the current academic year. I am proud to say that HSU will enter the 2019-20 academic year with a balanced budget. Most importantly, we made these difficult reductions while protecting our academic programs, adding new tenure-line faculty positions, and investing additional resources in student support. We launched several initiatives to make our campus and surrounding community more welcoming and equitable for people of color. We are making progress toward closing the opportunity gap in both persistence and graduation, and we recently achieved the highest four-year graduation rate ever at HSU. Looking ahead, HSU’s current strategic plan extends through 2020, meaning it is nearly time for an update. A new fundraising campaign, which will help assist our students with their basic needs and make college more affordable for them, is in the planning phase. We are ready to begin developing a new facilities master plan. The next president of HSU will have the opportunity to impact the future of this institution through strategic investment of resources based on a balanced budget and continued enrollment stabilization. On a personal level, I am looking forward to resuming some writing projects after serving as a university president for two decades. A draft manuscript on “leadership in times of chaos” has been in progress for more than 10 years. I also look forward to returning to writing a bi-monthly column for EARTH magazine focused on the intersection of science and society. I plan to remain very involved in higher education. I remain deeply committed to education — and particularly the transformative power of public higher education, which is so clearly illustrated in the work of the California State University. In the remaining months of the 2018-19 academic year, I will be focused on the goals that I outlined during Fall Welcome. These include our ongoing initiatives related to student success, strengthening a welcoming and supportive community for HSU’s growing diversity, achieving a balanced budget, and addressing the recommendations from our recent review by the WASC Senior College and University Commission. To these I now add an additional priority: planning for a smooth transition to new leadership next summer. Over the summer, I shared with Chancellor White my plan to make this transition. The Chancellor has indicated that he intends to launch a national search for a new president at HSU this winter. More information on that process will be forthcoming from his office. I have been truly honored to serve as your president for the past four-plus years. Working together, we have made significant improvements for our students, and we can see real progress from our focus on supporting their success. Thank you for what all of you do to support students in their educational journey.